There is something solid and lasting about a printed word. It doesn’t float away into the ether like the spoken word. So many of the words used over the airwaves and cable, all those modifying adjectives and adverbs, the polarizing interchanges among talking heads, are often useless, even detrimental, to reporting the news. They create emotions and opinions that rob a listener of independent thought, a power to think events through. There have been many changes in media in recent years. Newspapers have had a tough slough of it in the last half of the 20th and into the beginning of the 21st-century. According to the Bureau of Labor Statistics, daily and weekly newspaper publishers employed 455,000 reporters, clerks, salespeople, editors, designers, photographers and the like in 1990. By January, 2017 that workforce had been more than halved to 173,000 and the slide continues. The decline is ominous. In a 2018 article in the Washington Post, Margaret Sullivan wrote that research shows newspapers still produce 85% of accountability journalism journalism that unearths corruption and exposes abuse of power. New technology has given us the internet, Twitter, Facebook, and thousands of other sites to communicate with each other on the World Wide Web. Everybody, more or less, has become neighbors. In cyberspace, we share thoughts and, maybe, dreams with others. But, do we get hard facts that are crucial to wise decisions? Or, is it mostly idle chatter? Is it nothing more in the end than constituency journalism? 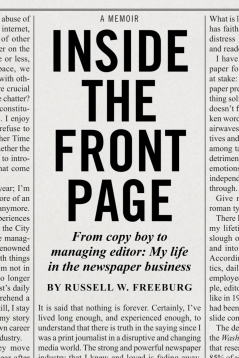 Russell W. Freeburg was Washington Bureau Chief for the Chicago Tribune and became managing editor of the paper in 1971. Russ began his journalism career in 1948 as a reporter for the City News Bureau of Chicago where he covered police and court events. For the next quarter of a century he had a front row seat to earth shaking shifts in media power as the newspaper industry battled for survival against the rise of television and the start of the digital age. He joined the Tribune in 1950, covering finance and business, national politics and the White House before becoming Washington Bureau Chief. He received the Tribune's Edward Scott Beck Award in 1962 for exclusive stories revealing attempts by the U.S. Department of Agriculture to withhold records in the Billie Sol Estes scandal. Freeburg served in the European theater in WWII, where he fought with the Eighth Armored Division in the Ardennes, Rhineland and Central Europe campaigns. After the war he married Sally Woodford and they had three chidren. In 1987, he co-authored Oil & War with Robert Goralski of NBC News. Freeburg is a graduate of Washington University in St. Louis and also attended Knox College. He is a native of Galesburg, Illinois and now lives in DeLand, Florida. This book hasn't recived any review yet.